Kardo Locksmith- Los Angelese Locksmith- \"locksmith near me\"
Question: What if I need a locksmith on Christmas (or any other holiday)? Will you guys actually come and help me right away or am I SOL? Answer: YES! When we say 24/7 we truly mean every day of the year. While a lot of companies say they offer around the clock but have no or limited service during major holidays. We have had a lot of customers switch to us as their preferred locksmith because we truly do answer our calls always. Don’t feel like you have to call five places in order to get a locksmith that is open in the middle of the night or on a holiday. 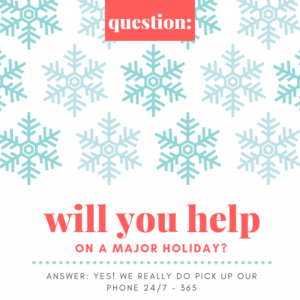 We’ll always answer our phones and be there to help you out! Review of the Week: Omri Y. Welcome to our first ever monthly newsletter!